Today I'm looking at a colour that I have mixed feelings about. Some shades of orange I quite like but others I'm not really that keen on. I only have five orange shades in my collection. You can probably see on the wheel that this shade is looking a bit dodgy! I actually painted the wheel a few weeks ago but thought I would apply a fresh coat over each colour before taking the picture. Unfortunately when I went to use Action I discovered that it appears to have turned. It's kind of separated and gone blobby in places, so that's why it looks so bad on the wheel. Fortunately I'm not particularly keen on this shade so this will be going in the bin. This is another one of the mini Max Factor varnishes that my boyfriend bought me for Christmas. He didn't do too badly and picked out some quite nice shades, some that I probably wouldn't have chosen myself but quite like now that I have them. I'm really not very good at describing coral shades but the swatch on the wheel is not too bad, the actual varnish is maybe just slightly more peachy than shown. As you've probably noticed the name of this varnish contains 'red' but I personally think this has a very orangey tone to it so I've included it with the oranges rather than my reds. It's a close call though and other people probably would have put it with the reds. This one may be one to try if you're not into a full on red nail. I've blogged about this recently and talked about how despite being called Pink Punch, I think this is more of an orange than a pink. I wanted a neon pink and couldn't decide between trying this and Bubblegum, but went for this because it had pink in the name. I was slightly disappointed when I got it home and tried it (I do like the colour, it just wasn't the pink I wanted) so I went back and also bought Bubblegum. Apologies for the dent in this on the colour wheel, I forgot this takes quite a while to become fully dry (I always ,use Seche Vite over the top to dry it much more quickly) and I placed another wheel over the top which then stuck to it! I've also blogged about this shade recently. This came in the July Summer Splash Glossybox and was one of the main reason's I ordered the box as a one off (how disappointed would I have been if I didn't receive it!). This was my first Ciate shade and although I wouldn't have chosen the colour myself I really like it. It makes me think of toffee apples! So those are my oranges. 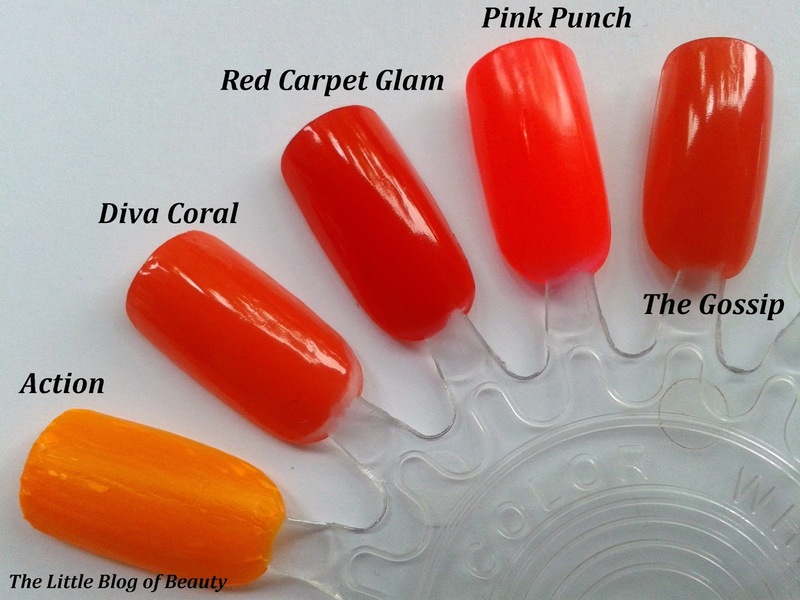 What do you think of orange nail varnish? I generally don't like orange on my nails (it tends to clash with my hair!) but I really like the look of the Essie action shade! Very Summery! I love the look and brightness of pink punch! Though I agree with you. It's stupid they called it pink when it really isn't.